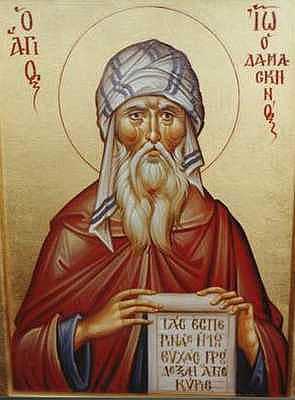 John of Damascus, a Credobaptist? Credobaptism seems to have persisted well beyond what some would suggest- even into the 8th century, and in the Eastern Orthodox world! John was of course born and raised by Christian parents in an area ruled by Muslims, thus cut off in many ways from Rome and Constantinople, although he was deeply involved in the iconoclast controversies of his time. One of the things bubbling up as I dig through the giants of the faith, is that more and more I am becoming convinced that infant baptism began as a regionally specific practice- primarily isolated to North African Churches. Among the fathers, we find the key advocates for infant baptism in Cyprian of Carthage, Augustine of Hippo, the Council of Carthage, Origen of Alexandria. The first specific and definitive mention of the practice of infant baptism is in Tertullian (who opposed it)- a native of Carthage. The fathers of the Middle East, Asia Minor and the Balkans appear to lean the other way (e.g. Cyril of Jerusalem, Basil, Gregory of Nyssa, John of Damascus, Theophilus of Antioch, Justin Martyr, and perhaps Chrysostom all support credobaptism). Here in John of Damascus we see the persistence of credobaptism long after Augustine had solidified the debate in the Latin Churches. The rise of infant baptism could be seen to testify more to the influence of Augustine, Origen and Cyprian rather than clear biblical and apostolic practice. This entry was posted in baptism, theology. Bookmark the permalink.